Felicia's taking a nap on a big heart pillow (with wings) and she's apparently having a good dream. I wonder if she wags her tail in her sleep like my dog? 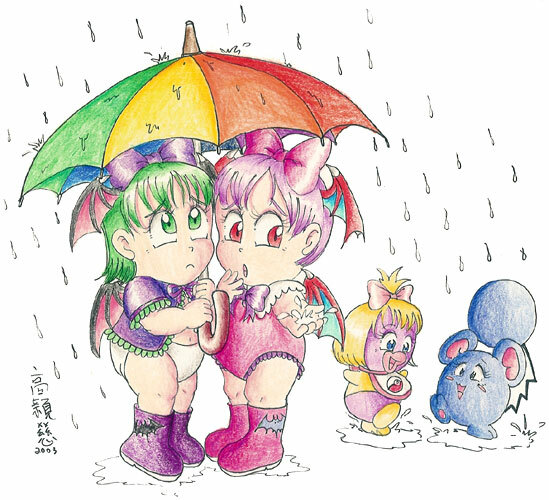 This is a nice picture of Morrigan sitting on two hearts. And she's wearing a very special valentine's outfit too. Oh, this is definitely one of my all-time favorite Lowena Ko pictures! Of course Baby Felicia is cute, but it's the little toy mouse that makes the picture. I had a little mouse toy just like that one when I was little! While Baby Sakura was painting her Easter Eggs, something hatched! It's hard enough when a teen becomes a mother, so imagine how difficult it is for a baby to become a mother! What's society coming to?! Before the Miller Lite catfight girls, there was Karin and Sakura. Maybe when they get old enough to drink, these two nitwits will fight over beer too. What if Weird Al made a parody of Ozzy Osbourne's "Crazy Babies" called "Ice Cream Babies"? Glad Jedah didn't look like that nasty Fetus of God thing from his stage! But he still liked to play with nastly little bugs when he was little. No wonder he grew up to be so strange. 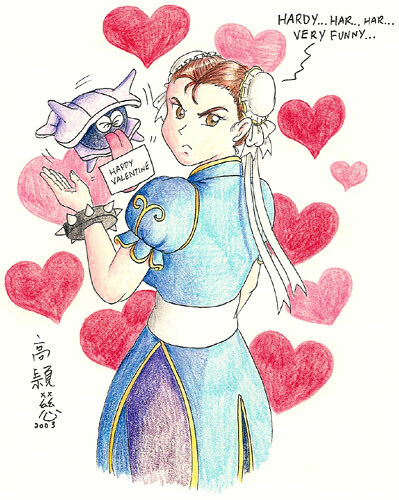 At first Chun Li was real happy to get a Valentines gift, but then she realized that it was all a big joke... nobody loves Chun Li anymore. Only from the mind of Lowena Ko. How many times have you heard me say that?! 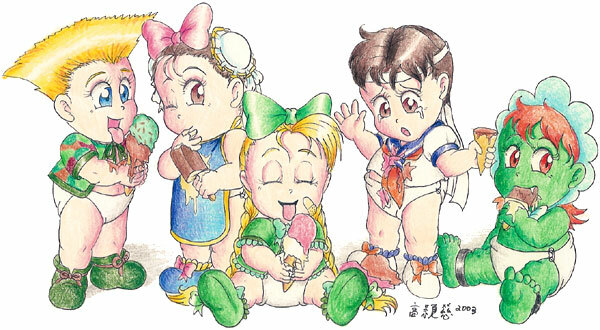 In this picture, Cammy plays a practical joke on her fellow Capcom Gals. Here's a poem/comic that Lowena draw about Morrigan and Lilith. The art, the humor, the opinions, and everything about this is classic Lowena Ko! 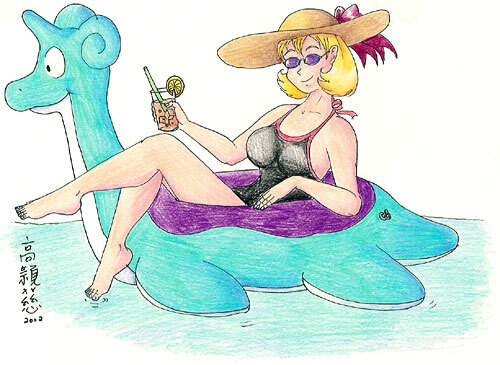 Out of all of Lowena's 2002 summer swimsuit pictures, I think this one's my favorite. Normally I don't like bikinis, but Rose just & her hat make this one look SO good! Mika looks great in her one-piece swimsuit. 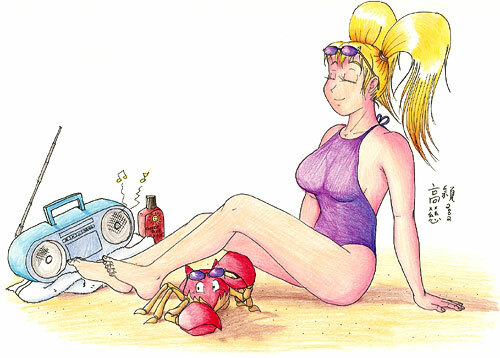 It looks like her and her little crab buddy are enjoying the sunshine & music. I wonder what kinda music Mika listens to? Never in a million years could I have imagined SF3's Makoto looking good, but she REALLY does here! Wow, Lowena's really amazing... I don't know how she did it. 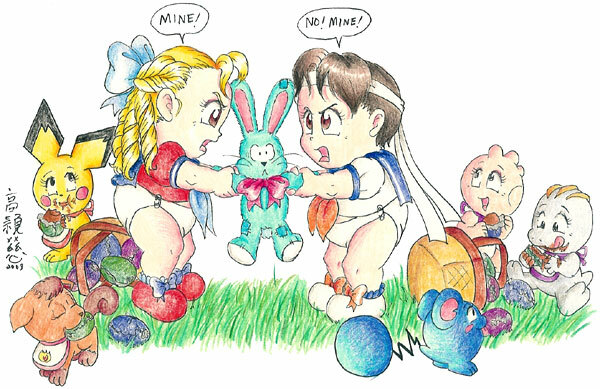 Okay Chun Li, I see what you're trying to do... you think that wearing a green one-piece like Cammy will make you look good too. Well, you're no Cammy, but I am happy that you've FINALLY tried to do something about your oh so old look! You see a swimsuit, and you automatically think "sun", right? But, demons don't like sunlight much. Do you think that maybe Morrigan lies out under a full moon instead? I guess the fact that they're evil demons doesn't matter... sisters will be sisters! Hold on tight Morrigan, or those things might bounce up and knock you right out! I'm not normally a guy who likes girls with big hair, but how can't you love Felicia's big blue 'do? Maybe it's the ears. Maybe some of you have been so busy staring at her scantily clad body that you never noticed her hair! Here's a nice black and white picture of Felicia. She's not really doing much... just posing. But it looks really good. And I like the little bell she's wearing. Capcom should add that too. Here are most of the SF gals posing for a picture at the beach. Cammy looks great, of course. But, Sakura & Karin are missing... maybe they're still kicking & scratching in the water? 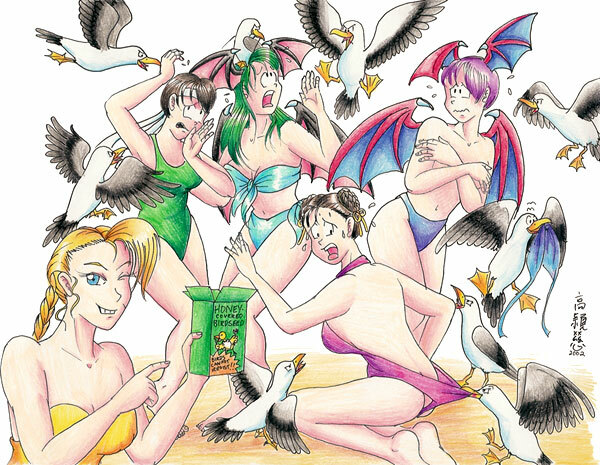 Summer of 2001 saw the release of the Capcom Gals Summer Paradise arcade prize collection featuring Cammy, Chun Li, Sakura, Morrigan, and Lilith. This is Lowena's interesting take on the summer paradise idea. 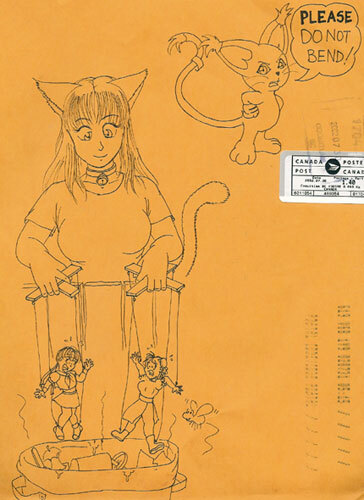 Whenever Lowena sends me an envelope full of artwork, she draws an interesting picture on the outside. 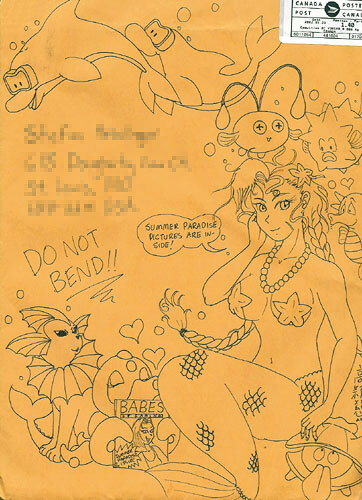 I bet the postal office workers get a few laughs... I know I do! So simple, so clever, and so cool!! See, that's what I mean when I say that simple fanart can easily be the best. Sometimes, fancy art and color can actually overshadow the simple beauty of a picture. Lowena is also a big fan of Felicia. Actually, I think we're all Felicia fans, right? Is there anybody that doesn't like her? I don't even like cats, and I love her!